Rewind-Couture Revisited is a second hand designer resale and vintage resale store in Toronto owned and managed by Dawn Librach, a recent graduate of the Ryerson Entrepreneurship program. 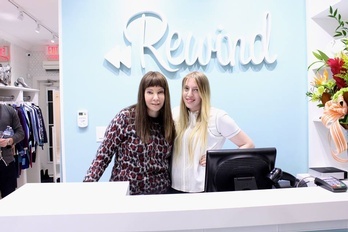 With the love for fashion and as an avid shopper in Toronto, Dawn opened Rewind in December 2014 as a vintage couture and designer couture resale store. Carefully hand picking every article in the store, Dawn has established a fresh new approach to designer and vintage resale clothing in Toronto. Organized by colour and style the racks are filled with luxurious hand picked haute couture, creating a one-of-a-kind experience. This second hand resale clothing boutique offers customers a broad range of designer labels, including; Chanel, Valentino, Dior, Escada, Prada, Helmut Lang, Rag and Bone/Jean, ACNE, and many more at an attractive price. Dawn makes sure that each piece of clothing is unique and pristine. In addition to these designers, Rewind-Couture Revisited has a fur collection and offers wardrobe consulting and custom clothing design. With her warm personality and out going disposition, Dawn makes everyone feel like they are a part of the Rewind family.